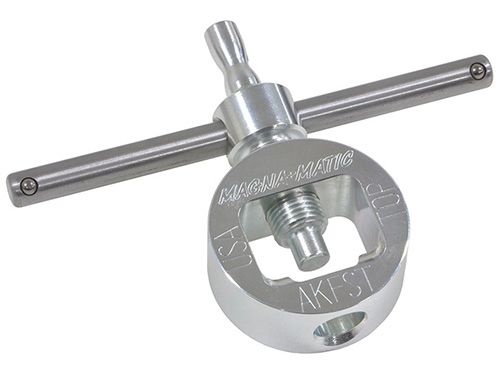 The Magna-Matic Ak-47 front sight adjustment tool is precision machined solid steel tool. The full circle construction is many times stronger than the traditional C-clamp sight tools that often break when used on frozen front sight posts. The extended t-handle allows for more precise control of your windage adjustments. The elevation adjustment tip is machined to give you more positive contact with the front sight post, and the long lever makes adjustment easy. This tool will work with most AK variants that have a standard front sight base, it will not fit AK-104 style gas blocks with integrated front sights or Yugo M92 "Krinks". This is official Union tool for sights adjustment! NOTE: It won't work on YUGO SKS!